We hear a lot today about ancestry testing and finding out about our heritage. Many of us want to know “who we really are.” While these tests can be fun, they can also tell us a lot about ourselves that we thought we knew but had all wrong. For instance, we may know that our ancestors emigrated from a specific country, and claim that as our heritage, but with the help of these tests, we may learn that said ancestor only briefly lived in the “country of origin” and our actual roots lie elsewhere. The test may not change some of the facts we already know; it just gave us a different way to look at them. Today I want to talk about a DNA test for municipal units – NAICS. The North American Industry Classification System is a great way to take a new look at your community. Just like the DNA tests described above, it can tell you so much on many different levels. At the broadest level, the two digit code, you can learn what industries in general are represented in your community. You may ask, “Why is this important? I know my companies and what industries they are in” – but do you? You may have a broad thought in your head such as automotive or even supplier; but did you know that there is no category “automotive” in NAICS? Did you know that what you considered an automotive supplier could be classified as a wholesaler? This is a new way of understanding your business community and the types of companies who may find your community attractive. Now you have opened a potential pathway to new markets and opportunities to improve your tax base. Digging deeper into the code at the three digit level allows you to get a little more specific and go from retail trade to motor parts supplier. At the four digit level, you can find that “automotive” label, but it won’t be stand alone. It will come with something like automotive parts dealer. You can get a list of NAICS classifications for your community through a database such as Hoovers. Your local librarian should be able to help you with that effort if you do not already subscribe to one. I encourage you to take the leap and find out “who you are” with your NAICS test. Authored by Khalfani Stephens, Director of Economic Development, City of Farmington Hills, and 2018 MEDA Board Vice President. Happy New Year: Make Habits Not Resolutions! As we usher in another year, the prevailing conversation around the water cooler centers around our resolutions for 2018. We also know that most of those resolutions (diet, exercise, read more, etc.) rarely make it past the first quarter. That’s why we need to focus on making better habits and not just making resolutions. It is safe to say that most successful people have certain habits in common. There is a great debate about what exactly those habits are, or what combination of habits guarantee success. But I think it boils down to committing to master those habits in areas that you have weaknesses. I have read many self-help books and taken countless professional/personal development courses throughout my life. While there have been great nuggets of advice that I have taken from those courses, the one course that has helped me navigate my day to day and realize some personal goals is Steven Covey’s “7 Habits of Highly Effective People”. Covey breaks down 7 habits that maximizes your time, effort and energy and encourages you to not only be a more effective leader, but also an effective follower. Trying to wholeheartedly incorporate all 7 habits on day one is not realistic, so again I reiterate working on those habits where you feel you may have some weaknesses first. So, for this New Year, I am reinforcing Habit 2, “Begin with the end in mind”. I am going to take the time to meditate on my goals, create my vision board and tweak my personal mission statement. Having a resolution of dropping a few pounds, or eating healthier is great, but if you commit to maintaining the habit of a healthy lifestyle your success can be found in your living. Times are good for most people right now with memories of the great recession fading fast, but for economic developers, today is the time to “make hay while the sun shines”. Good times have their own set of challenges, but they also provide great opportunities. The first is that of workforce development. I remember not too many years ago when the rallying cry was “Workforce Development is Economic Development”. While it still rings true today, and there are good jobs being created in most communities, employers are having difficulty filling them and retaining workers. This is a complex issue that involves wage rates, education, skills, mobility of workers, lifestyle choices, costs of living, and many more factors. Economic developers need to work with employers and other organizations to create holistic and custom solutions that allow local people to move up the economic ladder into these higher paying jobs. Additionally, an improving economy is creating labor shortages in the construction industry and a high demand for construction materials. This, along with rising interest rates, is pushing development costs upward. These higher costs lead to project financing gaps, which causes the private sector to ask communities for economic development. But, in these good times, should communities agree to approve economic incentives? The answer is yes, but only if it is in the best interest of the community by taking advantage of the today’s strong economy to forge a better future for everyone. Most communities are no longer in a state of desperation where generous incentives are necessary just to attract private investment of any kind. Instead, Economic Developers can now seek to facilitate development agreements between communities, businesses, and developers that share the costs and benefits of development. Jobs, income, investment, tax revenue, business spending, infrastructure, education, training, etc., all are part of the mix and should be considered in making public decisions to approve private development incentives. Now is the best time to for Economic Development Professionals to work with communities and businesses to demonstrate to all that Economic Development is Community Development. While the company launched its product in 2014, I was not introduced to it until the ICSC ReCon conference in 2016. The company provided a free webinar and encouraged everyone to use the “FREE” tool. With nothing to lose, I gave it a try and I am happy to report it was a great decision. It has helped me to promote some of my redevelopment sites to developers that I would never have been able to connect with otherwise and, better yet, promote difficult sites with absent owners. Matchmaker – OppSites Matchmaker makes it easy to describe your goals and delivers connections between people who have aligned interests, so you can make projects happen. Messenger – While Facebook, Twitter and Instagram provide instant messaging between friends and family, the OppSites Messenger connects public and private sector real estate professionals as well as economic development leaders who have aligned interests. Marketplace – OppSites empowers local leaders to showcase areas in their communities where new development or redevelopment would support the community goals. Unlike typical commercial real estate listings, the OppSites Marketplace is not a marketplace for the buying or selling of property, OppSites is a marketplace for what is possible in every city even if the property is not currently listed with a real estate firm. “If you want to attract development to your city, OppSites allow you to showcase opportunities in the OppSites Marketplace, which is free and publicly accessible. It allows you to market the properties in a unique way and showcase every aspect of the site, your development ideas, incentives, and of course your community profile. Whether the site is currently listed or not, you can showcase it and indicate the availability status. How great is that? You can actually market those difficult properties owned by difficult or absent property owners without it ever hitting the real estate market.” said Ken Bouchard at OppSites. The company began in 2014 and, since I have been a user, I have seen many upgrades to the user experience as well. They are constantly evolving and listening to the needs of their customers to make the product even better. I would encourage everyone to utilize this system to promote their available sites and gain the exposure I have. The more users the system has the better the outcome for all. You can try it for free today by visiting OppSites. Authored by MEDA Board Member and Education Committee Chair Kim Marrone, who is the Economic Development and Communications Director for the City of Oak Park. Don’t be an Average Economic Developer, be a MEDA Member! As community leaders, we are asked to be members of many different groups – professional organizations, fraternal orders, chambers of commerce and more. Each of these groups brings different benefits. Some provide networking opportunities, discounts, others provide easy access to a wide array of knowledge that would otherwise require hours of research. 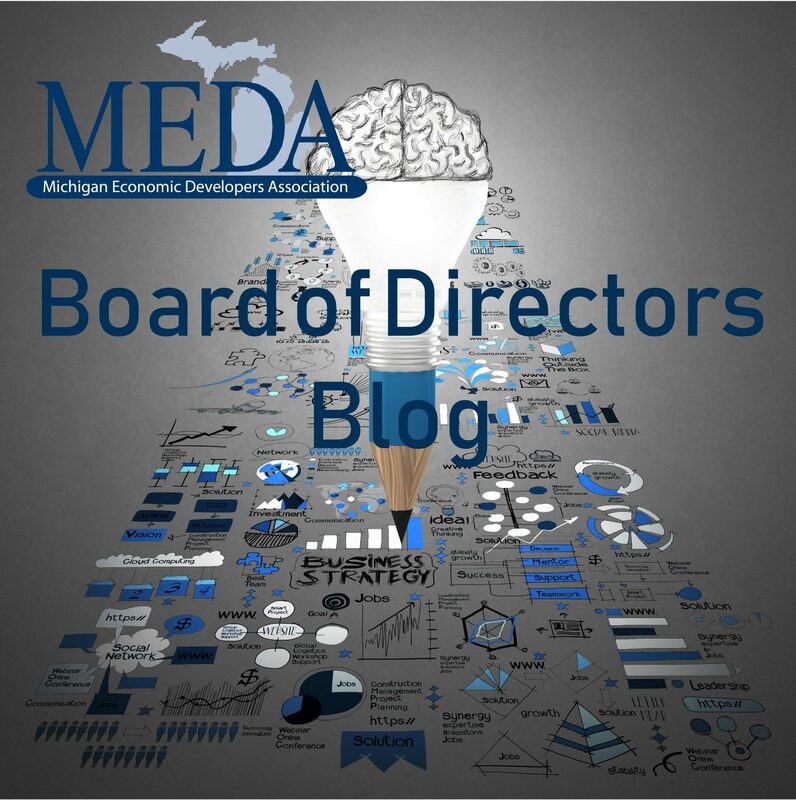 The Michigan Economic Developers Association (MEDA) provides all of this, and more! MEDA hosts three annual training seminars that keep Economic Development professionals at the top of their game. The Spring and Fall Toolbox seminars are excellent opportunities to learn about what is going on across the state and nation in economic development. Experts in different areas of practice lead deep dives and robust discussions of the subject matter to ensure that participants go back to their home community with knowledge that can be implemented right away. MEDA’s Annual Meeting is two and a half days of knowledge and networking bliss. Nationally relevant speakers, topics that have been vetted by members, and free evenings for meeting with colleagues from around the region are just a few of the many reasons that attending the Annual Meeting is an absolute must. Additionally, these events provide continuing education credits for nationally-recognized certifications from as The National Development Council (NDC) and The International Economic Deve lopment Council (IEDC). Of course you do not have to be a member of MEDA to participate, but if you are planning on attending each event, then your membership discount would cover the cost of joining! Additionally, you would get the members’ only benefit of being able to anonymously (or not) poll fellow members about any topic in municipal management/economic development to help move your community forward. This is only the tip of the iceberg; check out www.medaweb.org for more awesome events and benefits. Still not convinced of the benefits of membership? Consider this – MEDA is currently in the process of offering all of the courses needed to obtain the Certified Economic Developer (CEcD) certification through the IEDC. Courses are normally held in Lansing and MEDA members get a discount – convenient and economical! If you’re not currently taking advantage of MEDA benefits, then take a second look, grab your discounts, get connected with colleagues, and use MEDA to help research your next project. Authored by MEDA 2017 Board Secretary Khalfani Stephens, CEcD, EDFP, Director of Economic Development, City of Farmington Hills. In January when the committee began planning for the MEDA Annual Meeting, our common goal was to ensure a meeting platform that fostered connection and relationship building. It was my pleasure to chair a committee with so many engaged and hard-working members who understand that successful economic development professionals seek peer connections and industry leaders to learn valuable information on how to build a strong organization and community. This conference will allow you to Connect with other economic development leaders from throughout the state. Musicians, caricature artists, face painters, jugglers, magicians and even aerial acrobats are all a part of the street performer series each Thursday night, right downtown. At the edge of the town is the vast Windmill Island Gardens where you can tour a replica of the 14th century Wayside Inn and see the antique Dutch carousel which features hand-carved and painted wooden horses. You can find all about downtown Holland here. The farmers market at the end of 8th Street is open on Wednesdays and Saturdays, and reflects the agricultural abundance in our region and ethnic diversity of our residents. New Holland. Coppercraft. Big Lake. Macatawa Ale. Our alluring breweries expertly cater to distinguishing palates and some serve options only found in West Michigan. Paddleboarding. Sand castle building. Sunset viewing. Sun bathing. Lake Michigan beckons with each wave and calms the soul. Sneak away to one of our state or county parks to refresh your soul and spend time with those you love. The new playground at Holland State Park was funded by the MEDC’s Patroncity program. You can find the complete list of county parks to visit here. The MEDA annual meeting will be content- and connection-rich. Once you are done learning, go ahead relax and explore. For more information about the Holland region, click here. This year’s annual MEDA conference will start with a bang and end just as strong. Learn about the technology it takes to commercialize new specialty and bio-based chemicals, all while making them cost effective for the organizations manufacturing them. MSUBI has incorporated science, engineering, operational, and business expertise into their program to make them one of the top regional research and innovation resources, where commercialization is happening on the banks of Lake Macatawa in this facility that is also part of the Holland SmartZone. West Michigan is known for our craft beer industry. Don’t miss out on the opportunity to tour one of our breweries and find learn about their impressive Brew on Site system which attributes to their industry’s success. The Holland Energy Park is an international example of a municipal utility with a plan for the community’s future that includes baseline generation, beautifying the eastern gateway to downtown Holland and restoring wetlands. This brand new combined-cycled natural gas power plant is the only plant of its type to be built in the United States this year. Experience some of the latest energy production technology and how the Holland Board of Public Works is managing it. This tour has limited spots available; sign up soon. The conference grand finale will include an exciting ignite session to provide ideas for you economic development strategy with key local, state and federal leaders. You will have the opportunity for one-on-one conversations to extend your network and gain valuable connections that will contribute to becoming a more effective economic development leader in your community. To find out more details about the tours, read here. To register and find out more about the conference visit here. In economic development sharing best practices and growing good relationships is imperative to being successful. I have enjoyed volunteering on the Education Committee to develop The Spring Economic Development Toolbox and co-chairing this year with Kimberly Marrone, Economic Development and Communications Director, City of Oak Park. What will it mean for trade in a major manufacturing state? How will it impact our state’s relationships with foreign companies? Will the dynamics of foreign workers shift? And what will the impact be on our university’s admissions of international students and the local economies of communities they reside in? Although residents in many communities are thriving, there are those who are experiencing declining incomes, low or no participation in the labor force, and living in increasingly concentrated poverty. Expanding economic opportunity for these residents impacts a region’s ability to grow its economy and be the best it can be. A review of a paper presented at IEDC explores the issue of economic opportunity from a developer’s perspective, and highlights best practices from nine case studies. One Stop Ready is Oakland County’s economic development program to provide local communities with the resources, tools and trainings needed to capitalize on local strengths, improve processes, and make its vision a reality. A review of best practices and of the Benchmark Self-Evaluation Tool. How the result of this co-learning project is making an impact and why economic developers should pay close attention to credentials. Visit www.medaweb.org/springtoolbox to view the full agenda and to register. Relationships are critical to being successful in economic development. Whether it is with your business client, a prospect, legislators, your colleagues, coworkers or any stakeholder … the stronger the relationship, the smoother the process. In order to build and strengthen these relationships, we must effectively communicate with each stakeholder group. So in the age of technology, where abbreviated responses and instant answers are required, how do make sure we as practitioners are communicating in a way that meets our relationship goals? With as many as three generations in the workplace, are we taking into consideration how each of our stakeholders best processes the information we provide? In our office, we talk about this often and have created some basic guidelines to help use the appropriate method of communications. Below are some tips you may want to consider. Most businesses utilize email, whether it is for communicating with clients, co-workers or both. It is a convenient way to pass along information, questions, documents, photos and more. While it is extremely convenient, it is not always the best form of communication. If you need an immediate answer, call, don’t email. Not everyone checks their email continuously throughout the day. Avoid emailing to cancel last minute plans. Again, not everyone always has email access, speaking with them directly to ensure they received the message is important. Do not send an email when discussing a complex, lengthy or confusing topic. It is best to call and explain and maybe follow up with an email summarizing afterward. If you are sending an email to avoid having the conversation face-to-face, that is a sure sign that it is a message that should not be conveyed via email. When utilizing email, especially in a professional setting, there is simple etiquette that should be followed. These guidelines can help keep your email organized and cut back on unnecessary messages. The subject line should reflect what the email is actually about. If you’re starting a new “conversation” in an email or have more than one topic to discuss, start a new email with an appropriate subject line. This will help the receiver keep track of the information and be able to scan subject lines to refer back later. The recipients included in the “BCC” line are not visible to others. This should be used sparingly. “BCC” is a great way to protect the email addresses of those you’re emailing to or keep an email shorter if you’re sending to a very large group, but should not be used to secretly include someone on an email. e. – A sends an email to B, C and D asking if someone can complete a project, C should reply all saying it is taken care of so A, B and D know it is done and can delete the email. e. – A sends an email to B, C and D asking what everyone wants for lunch, C should reply only with their lunch order so they don’t clutter B and D’s email. Reply with all of your thoughts in one email. Emails don’t need to be replied to within seconds of receiving, take some time to gather your thoughts so you can send your response all at once. When responding to an email that is disconcerting or upsetting, do not hit send for at least an hour, re-read with a clear head and new perspective. Read your email (including the email “To,” “CC” and “BCC” line and subject line) before you hit send. This is your last chance to correct mistakes and make sure you did not accidently include someone who should not be in the email. Be professional! Use the person’s name, use proper grammar and punctuation and sign the email. Leave your texting abbreviations for communicating with your teen! One last tip – if you work at a desk and have your email open all day, it can be tempting to click over every time you get that pop-up or hear that “ding.” The best thing to do is disable the pop-up and turn off the sound. This way you can schedule two or three times a day to follow-up on emails and you are not distracted from other work with each email that comes in. No one should expect an immediate reply to an email, if you reply within 24 hours that should be sufficient. There are always exceptions to these “rules,” but they should help keep you organized, looking professional and the recipients of your email should appreciate your etiquette as well. This all goes a long way to building a positive relationship with all your stakeholders. After 10 years….the MEDA Annual Conference says, HELLO DETROIT! If you didn’t attend this year’s MEDA Annual Meeting in Downtown Detroit, you missed out! Detroit is on a comeback, driven in partnership by some of its large corporations and local businesses with a belief in the city’s future. According to the Detroit Regional Chamber, there has been at least $3.4 billion in investment and development announced in the city, since 2013; including 125 new restaurants and retail establishments that have recently opened. Overall, there are 378 restaurants in the city, and residential rental units in both downtown and midtown Detroit were nearly 100% fully occupied between 2013 and 2014. During the MEDA tours, there was evidence of a lot of economic opportunity, showing people are coming into the city to work, live and play; creating a vibe that was infectious and inviting. To further accelerate the process of turning downtown Detroit into a live, work, play hub that can draw in people from the outskirts of the city and suburbs, the implementation of a light rail project known as the QLINE financed by the private sector, is expected to be operational Spring 2017. Additionally, two recent big projects include Amazon‘s announcement last fall to unveil a new corporate office and technology hub in the City in 2016, and the new Nike retail store. What’s more, since 2009 nearly 227,000 private-sector jobs have been added through the end of 2015, according to the Bureau of Labor Statistics. The MEDA tours showcased how obvious Detroit has come in the past few years due to a coordinated development effort, largely led by the private sector. What’s important to understand is it wasn’t one building or so-called impact project this time around, unlike past efforts to revitalize the downtown. This time, it highlights a strategic approach involving many buildings with an intent to connect them with a network of public and semi-public spaces where everything works together to reveal the unique character of downtown Detroit and transform it. If you haven’t been to downtown Detroit lately, I encourage you to come explore and experience a different Detroit…I know you will be pleasantly surprised! Monique Holliday-Bettie, Economic Development Manger, DTE Energy is the MEDA Board Secretary in 2016.